CBET No. 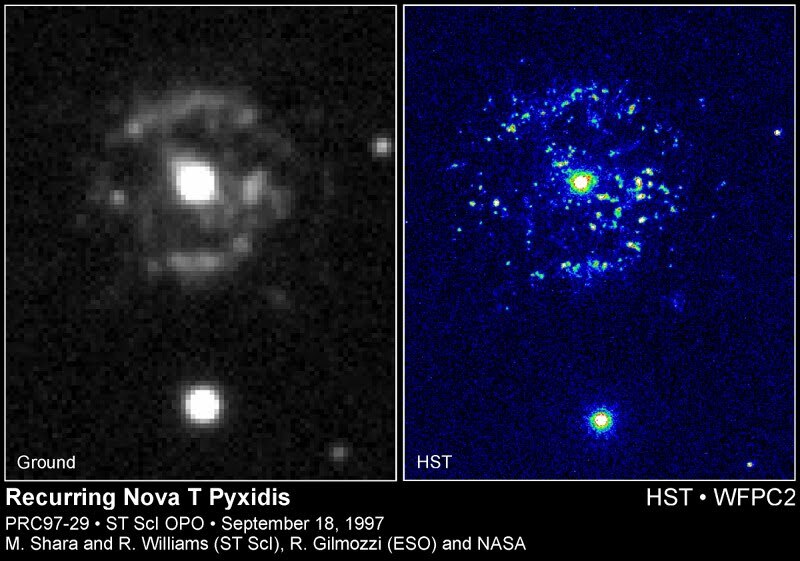 2700 issued on April 15, 2011 reports that the recurrent nova T Pyxidis has been discovered in outburst. It was detected by by Mike Linnolt at visual magnitude 13.0 on 2011 April 14.2931 and the outburst has been visually confirmed by several observers. This is the first outburst of T Pyx since December 7, 1966 (discovered then by Albert Jones), nearly 45 years ago, when it reached visual magnitude 6.5 from fainter than 15th magnitude; it was brighter than magnitude 8 for two months. Previous outbursts occurred in 1890, 1902, 1920, and 1944. There are only ten known galactic recurrent novae. Below you can see the five maxima of the recurrent nova T Pyx from 1890 to 1967. AAVSO Light-Curve for the period 1966 to present. T Pyxidis is 6,000 light-years away in the dim southern constellation Pyxis, the Mariner's Compass. 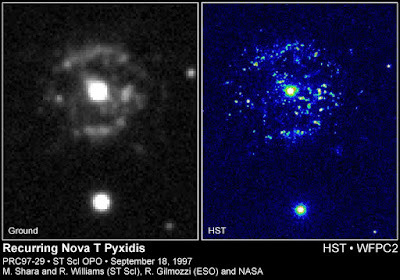 In September 1997, astronomers released an image of T Pyxidis taken using the Hubble Space Telescope. The Hubble's image shows that the shells of gas around the star that were blown off during several eruptions, are actually more than 2,000 gaseous blobs packed into an area that is 1 light-year across. On April 15.41 we have been able to image T Pyx remotely through Gras network from Officer, Australia (MPC Code - E03) using a RCOS 12.5" - FL 1950 @ f/6.3. The object has reached the unfiltered magnitude ~8.5. Click on the image for a bigger version. Follow-up observations are strongly encouraged!! The Mpec circular 2011-G60 issued on April 09, 2011 announced the discovery of a new Aten asteroid officially designated 2011 GP59. This asteroid (~ magnitude 17.5) was discovered by La Sagra Survey through their 0.45-m f/2.8 reflector + CCD, on images obtained on April 08.9, 2011. After posting on the Minor Planet Center's 'NEOCP' webpage, other CCD astrometrists have been able to follow-up the new object to define its orbit. According to the preliminay orbit, 2011 GP59 is an Aten type asteroid. This class of asteroids are defined by having semi-major axes of less than one astronomical unit (the distance from the Earth to the Sun). 2011 GP59 will have a close approach with Earth on April 15, 2011 at 1909 UTC at rougly 0.003567AU or 1.39 LD (Lunar Distance) reaching the magnitude ~13. Its absolute magnitude H=24.30 correspond to an approximate diameter of 50 meters. 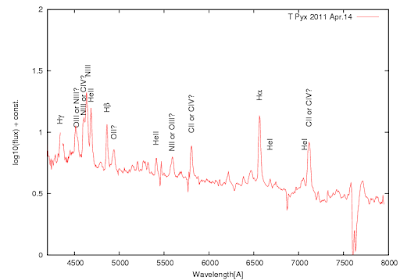 2011 GP59 shows evident magnitude fluctuations. 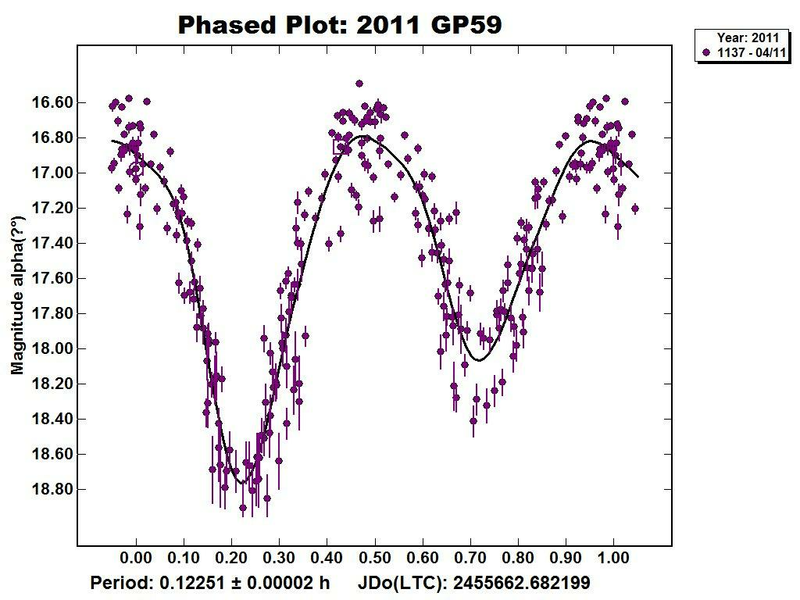 Below you can see a light-curve made by Brian Skiff (Lowell Observatory): 6-hours of observations using the Lowell 0.55-m Schmidt with 45-second exposures showing an amplitude in excess of 2 full magnitudes over a period of roughly 7.5 minutes. We have been able to follow 2011 GP59 on April 12.35 remotely from the GRAS Observatory (near Mayhill, NM) through a 0.25-m, f/3.4 reflector + CCD. 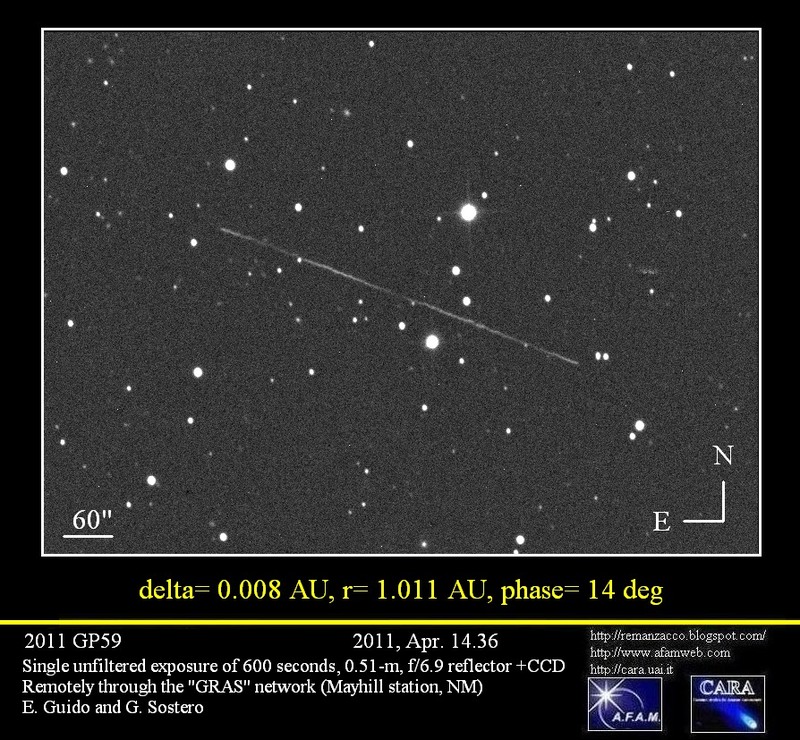 Below you can see an animation showing the fast movement (the object was moving at 10.5 "/min) of 2011 GP59 on the sky on April 12, 2011. Each frame is a stack of 2x20-second exposure. The asteroid is moving from the top left corner to the bottom right corner. In the animation you can easily see the rapid brightness fluctuations of this object. 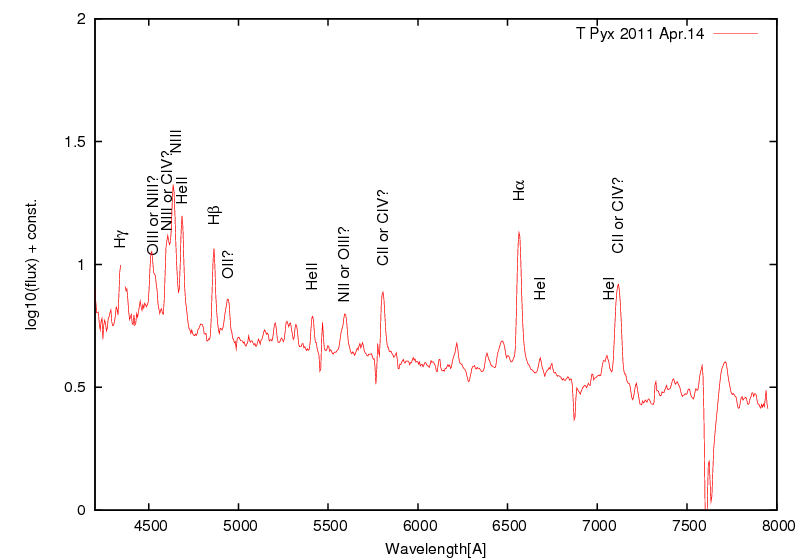 We imaged 2011 GP59 on April 14.36, 2011 remotely from the GRAS Observatory (near Mayhill, NM) through a 0.51-m, f/6.9 reflector + CCD. IAUC nr.9204, issued on 2011, Apr. 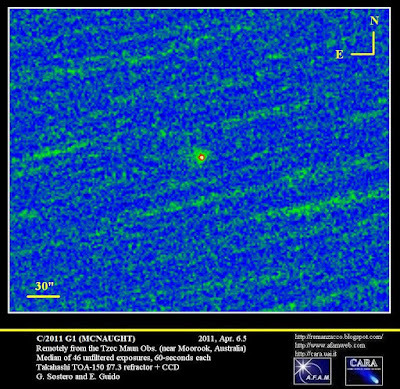 06, announced the discovery of a new comet (discovery magnitude 17.3) by R. H. McNaught on CCD images obtained on Apr. 05, 2011 with the 0.5-m Uppsala Schmidt telescope at Siding Spring . 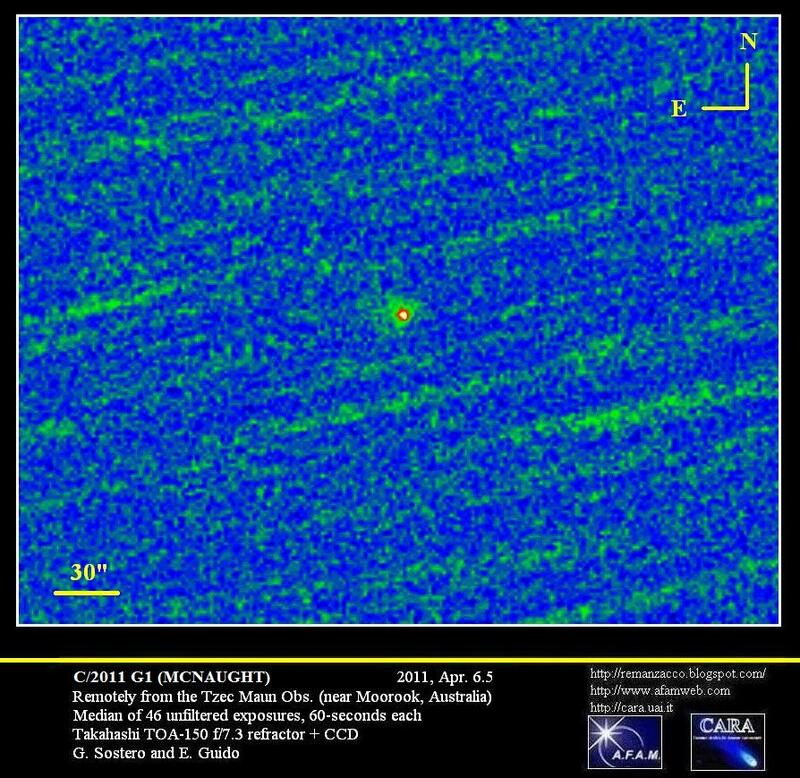 The new comet has been designated C/2011 G1 (MCNAUGHT). After posting on the Minor Planet Center's 'NEOCP' webpage, this object has been found by several CCD astrometrists to show cometary appearance. 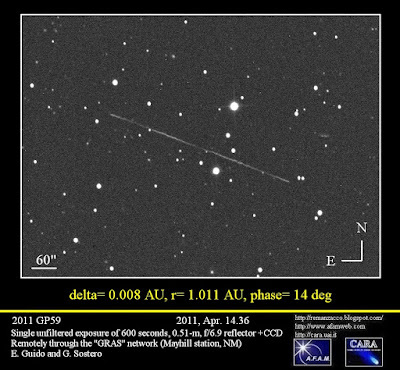 We performed some follow-up measurements of this object while it was still listed in the NEO-CP, on 2011 Apr. 06.5, remotely from the Tzec Maun Observatory (near Moorook, Australia) through a 0.15-m, f/7.3 refractor + CCD. Stacking of 40 unfiltered exposures, 60-sec each, shows that this object a coma nearly 8-arcsec in diameter with a sharp central condensation, short tail about 15-arcsec long toward PA 15. According to COCD webpage, this is the 59th comet discovery for LINEAR Survey. The Mpec circular 2011-G45 issued on April 06, 2011 announced the discovery of a new PHA asteroid officially designated 2011 GM44. This asteroid (~ magnitude 16) was discovered by R. H. McNaught through the 0.5-m Uppsala Schmidt telescope at Siding Spring, on images obtained on April 05.4, 2011. After posting on the Minor Planet Center's 'NEOCP' webpage, other CCD astrometrists have been able to follow-up the new object to define its orbit. 2011 GM44 had a close approach with Earth on April 01, 2011 at rougly 0.0234AU. We have been able to follow it while still on the neocp using a the Tzec Maun Foundation scope: the Takahashi TOA-150 f/7.3 refractor + CCD (located near Moorook, Australia). C/2011 C1 (McNaught) is at present the brightest comet in the sky (~m1=10) and it will reach the perihelion on April 18, 2011 at about 0.9 AU. This comet was discovered by R. H. McNaught through the 0.5-m Uppsala Schmidt telescope at Siding Spring, on images obtained on 2011, Feb. 10.7. 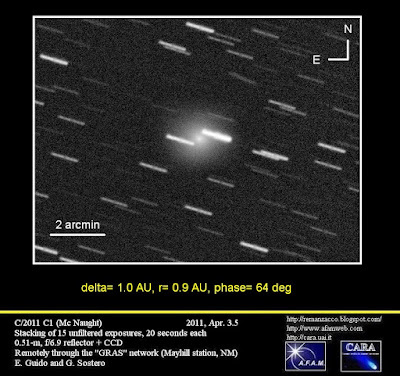 We have observed this comet again on April 03, 2011 remotely from the GRAS Observatory (near Mayhill, NM) through a 0.51-m, f/6.9 reflector + CCD. Below you can see the resulting image, stacking of 15 unfiltered exposures, 20 seconds each. Click on the image for a bigger version.